There are no physical signs you’ve entered the National Radio Quiet Zone, a 13,000-square-mile area that covers the eastern half of West Virginia. But the silence gives you a signal. Somewhere around the Virginia-West Virginia state line, the periodic buzzes and pings of our smartphones stopped. “Zero [service]. Searching,” said photographer John Poole, who traveled with me to the zone. Caleb Diller is a DJ at WVMR-AM, Allegheny Mountain Radio, in Frost, W.Va. The station broadcasts at a low enough frequency to avoid being banned. Almost every radio station disappeared, too, except for Allegheny Mountain Radio, which broadcasts at a low enough frequency to avoid being banned. The county still hasn’t progressed to constant connectivity. That’s because it sits within a zone designed to protect a sophisticated radio telescope at the National Radio Astronomy Observatory from interference. The Robert C. Byrd Green Bank Telescope is the world’s largest fully steerable radio telescope. Radio telescopes work by tracking and reading the energy waves that come from stars or gases, but they have to be located in sparsely populated areas to avoid electromagnetic interference. The Green Bank telescope is the largest fully steerable radio telescope in the world. The Green Bank Telescope looks like a giant dish. It’s as tall as the Washington Monument and large enough to fit 2 acres of land in it. The Robert C. Byrd Green Bank Telescope is protected from interference by federal and state laws. The energy of Wi-Fi or cell signals can confuse or interfere with the telescope’s readings — and it can trip the receivers at the government’s nearby Sugar Grove research facility, which is also in the zone. “Because we’re looking at these very, very faint signals, we need to live in a very, very quiet area. In the same way where if you had an optical telescope, it needs to be high on the mountain away from other light,” O’Neil says. So a federal quiet zone law and an accompanying state law — the West Virginia Radio Astronomy Zoning Act — combine to keep the area very radio quiet. No interference is allowed. “We still have communications. I mean, it’s just … older. Dial-up telephones. 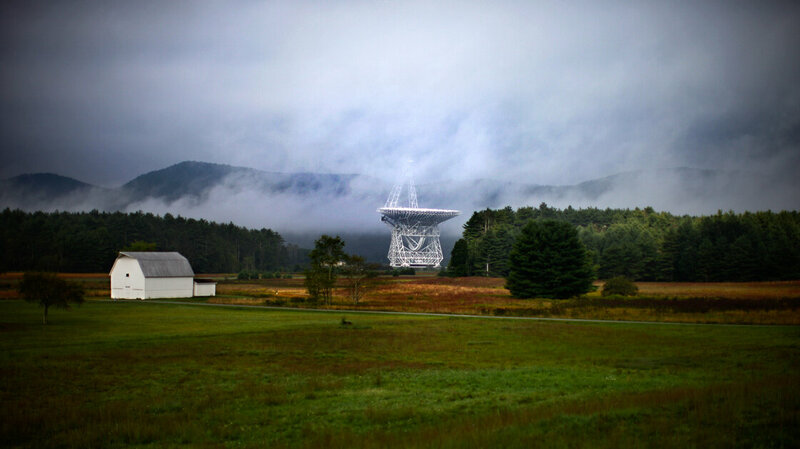 We still have phone booths,” says Chuck Niday, an engineer for the National Radio Astronomy Observatory and a volunteer at Allegheny Mountain Radio. Emergency communications are allowed in the zone, as is ham radio, a hobby among a set of West Virginians who chitchat or coordinate plans over their ham radios as they would their cellphones — if they had cellphones. “Last year the big windstorm we had, we were without power for some days. And without a lot of communications. All the phone lines were down, so we had different spots around the county where we could talk from one end of the county to the other, and maybe relay about a store being open or somewhere having ice,” said Pat Schaffner, a Green Bank native. 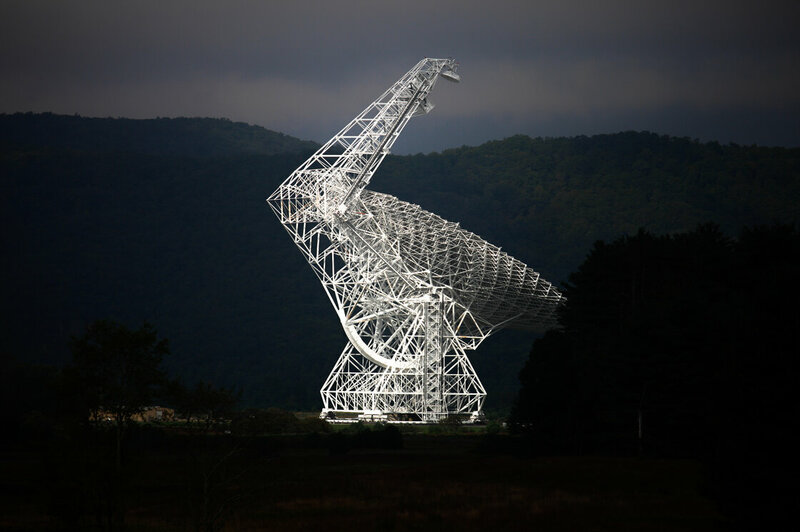 To keep the zone protected from signals that could confuse the telescope, Niday and others from the NRAO drive the 20-mile radius around the Green Bank Telescope weekly, policing for possible interference. “Say someone has a Wi-Fi service set up near the observatory that’s causing us interference, we can ask them to shut it off and most of the time they do,” he says. But keeping the noise down around here is getting harder these days. “If you think back to 1956 when this site was first built, there were issues with radio noise, but most of those issues came about through cars and spark plugs and power lines. And now we’re living in a society where everything is wireless,” O’Neil says. 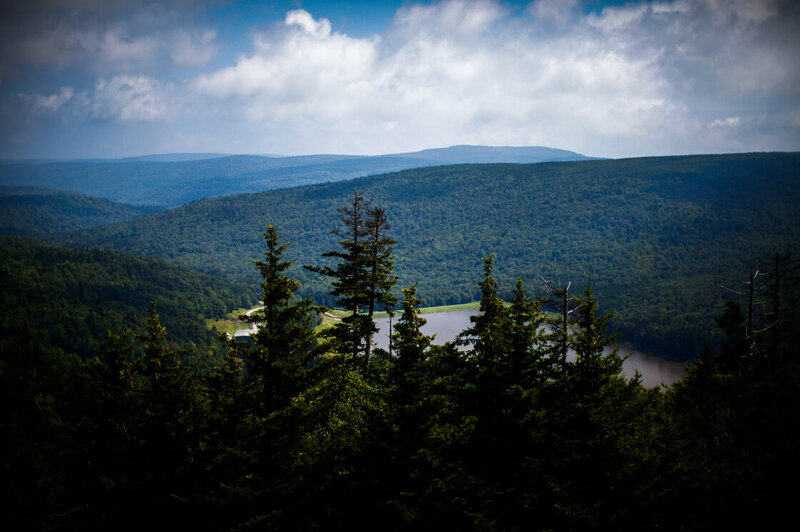 And constant connectivity has become a consumer and cultural demand, as one of the biggest employers in the county — Snowshoe Ski Resort — knows well. The resort happens to sit right inside the Quiet Zone. On busy weekends, it hosts as many out-of-towners as there are residents in Pocahontas County. So Murphy has to get creative to get customers cell service without running afoul of the astronomers. “We have to find a way to communicate that doesn’t interfere with them,” says George Murphy, Snowshoe’s IT director. 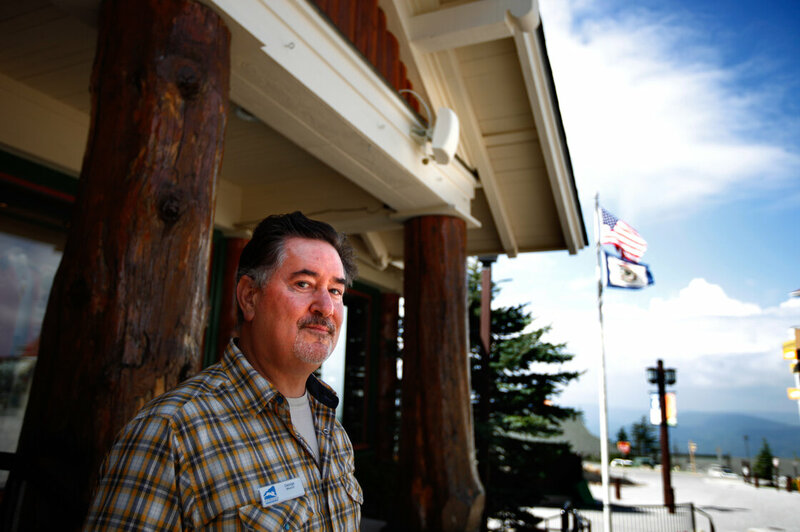 George Murphy is the IT director of Snowshoe Mountain Resort, which is within the 10-mile radio quiet boundary of the NRAO telescope. He’s had to find inventive ways to bring connectivity to the resort, including installing short-range cell receivers like the one shown here, mounted on the building behind him. This summer, Murphy got a system of shoebox-size antennas installed in the resort’s retail village. Using something called DAS technology, which involves short-range cell receivers, he brought cellphone service to a pocket of Snowshoe for the first time ever. Change seems to be in the mountain air. But for most of the area, life remains slower paced. Instant messaging and texting remain something Niday sees on television and when he travels out of state. “It’s nice to be able to pull something out of your pocket and send a message to someone and get a response within 30 seconds or so. But I don’t know that it’s that necessary. At least it’s not around here,” he says. Around here, folks seem content to stay disconnected. At least for now. The view west from the top of Snowshoe Mountain Resort, which is within 10 miles of the NRAO.